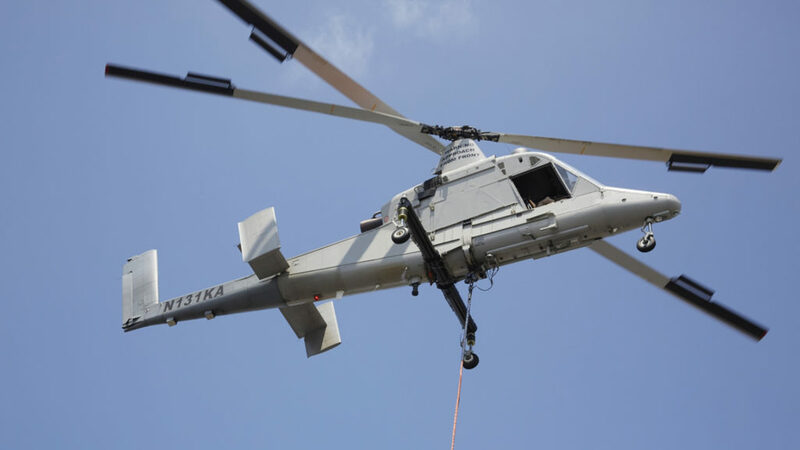 Kaman Aerosystems, a division of the aerospace segment of Kaman Corporation, has announced that it received its third order in the quarter for the K-MAX medium-to-heavy lift helicopter. This brings the total number of firm orders since the relaunch of production to 11 units. The most recent order is from Precision Lift, LLC of Baker City, Oregon. This is the second aircraft purchased by Precision Lift in the last 12 months and it will join the company’s fleet of firefighting assets. Development of the K-MAX was led by Kaman founder and former CEO, aviation pioneer Charlie H. Kaman, and received Federal Aviation Administration certification in 1994. The single-engine, single-seat K-MAX is a rugged low-maintenance aircraft that features a counter-rotating rotor system and is optimized for external load operations and designed specifically for vertical reference flight. The aircraft can lift up to 6,000 pounds (2,722 kg).